We specialize in mowing for pipelines, stations, plants, utility lines, and manned facilities. For over 25 years, we have been a leader in maintaining and mowing rights-of-way safely and effectively. We have the ability to develop a monthly or seasonal mowing schedule to fit your company’s needs. 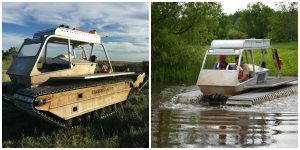 For rights-of-way inaccessible to land vehicles, we offer aquatic marsh mowing services and equipment as well. These tracked vehicles can navigate perpetually wet and boggy areas that traditional tractor-mowers cannot.